Our venerable Brother Taylor celebrated his eighty-third birthday on the 10th of March last. 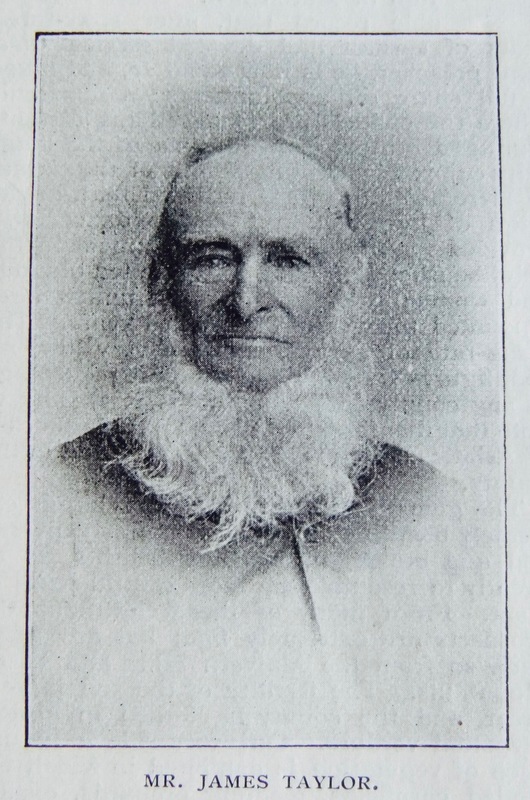 It is a remarkable record that, after sixty-three years of earnest and devoted service as a local preacher, he is now equal to, and takes a full share of, appointments in a circuit where the chapels are scattered and distant. Our aged brother is an instance of the longevity enjoyed by the inhabitants of the county of Herefordshire. It is recorded that, in the reign of James I., a ‘Morrice dance’ was provided for the king’s entertainment in the neighbourhood of Ross, in which ten old men and women took part, whose united ages amounted to over one thousand years. The death-rate of Herefordshire is very low, recent figures showing the smallest percentage of any county in England. It is worthy of note that there is no record of any single case of Asiatic cholera ever having occurred in the county. The general aspect of Herefordshire is extremely beautiful; its surface is finely diversified and broken by swelling heights, so as greatly to resemble the more central parts of Kent. From many of these elevations the prospects are extremely fine; but are peculiarly so from the Malvern Hills and Black Mountains. The fertility of the soil is very great, and the county is clothed in almost perpetual verdure. On every side a luxuriance of vegetation is exhibited in widely-extended cornfields, teeming orchards, expansive meadows, and flourishing hop-grounds. Nor is the air less congenial to the health than the face of the county is interesting to the eye. The Rev. John Morton, who was then superintendent of the Presteign circuit, saw in this young convert the marks of a preacher of the Gospel. At the March Quarterly Meeting, in the year 1835, Mr. Taylor’s name was put on the plan as a Prayer Leader without his consent or previous consultation. On receiving his first plan he scarcely knew what it meant, but falling into line at the call of duty, he has continued a faithful soldier of the Cross through good report and evil. At this time the Presteign Circuit was very wide, embracing on the one side Knighton and on the other Hay. Chapels were few, and the services were conducted chiefly in cottages and farmhouse kitchens. Many were the cases of persecution in consequence of such innovations, yet, notwithstanding, the work of God spread and grew, and, as a result of the heroic faith and courage of Mr. Taylor and his contemporaries, we have now more chapels in the villages of Herefordshire than has any other Nonconformist body. Mr. Taylor is a man of medium height, slim proportions, active temperament, and strong physical endurance. His head is well formed, but what strikes you most, is the quick, piercing eye indicating a keen observer of men and things. His mind is more practical than philosophical. He cannot be said to have studied a wide range of subjects; nature and the Bible have occupied his chief thought, hence there is an originality about his discourses which makes them attractive. While he may be regarded as rigidly orthodox, he is not stereotyped in his views. He does not fail to recognise the ever-varying conditions of human history, and therefore welcomes any new practical measures which may be deemed expedient to render more effective the work of the Church in the regeneration of society. As a preacher he is well received, and his sermons are often made impressive by personal reminiscences. One pleasing feature of his discourses is that he seldom overlooks the children. His vocal powers are still wonderful. He is therefore heard to advantage the camp-meetings which have not yet died out in the villages. He is loyally devoted to the Connexion, and takes a deep interest in its official life, both in his own circuit and the wider constituency of Primitive Methodism. This is to be accounted for from the fact that, from the time he commenced housekeeping, his home has ever been available to the preacher. Its literature has always been welcomed and, for over sixty years, the Primitive Methodist Magazine has been taken by him. He has attended a number of District Meetings, and represented the District twice at the Conference. It was therefore, a fitting appointment when he was made a Deed Poll member at Manchester Conference of 1897. He has been a regular contributor to the funds of the circuit, and recently paid £50 debt off the chapel of which he is steward at Almeley. In politics he is an ardent Liberal, and has been a member of Almeley School Board over twenty-five years, and is now vice-chairman. James was born on 10 March 1810 and baptised on 1 September 1816 at Almeley, Herefordshire. His parents were John and Jane. James married Mary Ann Prothero (abt 1818-1894) on 12 November 1838 at Lyonshall, Herefordshire. Census returns identify no children, although they brought up a niece, Elizabeth Lloyd, who lived with James until his death. James died on 8 October 1906 at the “Firs”, Lyonshall, Herefordshire. This page was modified on 9 January 2017 to add a transcription of his obituary published in the Primitive Methodist magazine 1908.